Tata Power Delhi Distribution Limited (Tata Power-DDL) becomes the first utility in Asia to achieve PEER (Performance Excellence in Electricity Renewal) GOLD Certificate from Green Business Certificate Institute (GBCI). PEER is a certification program that measures and helps improve power system performance and electricity delivery systems. 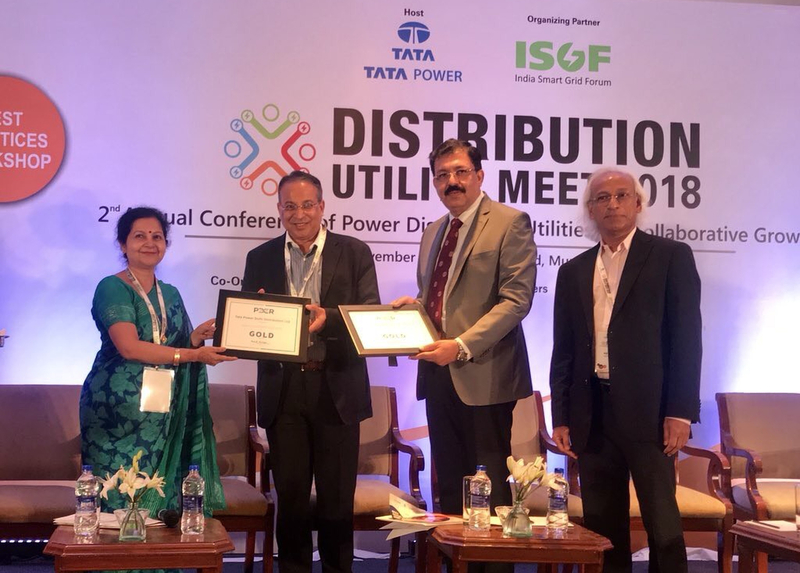 The award was presented by Ms. Milli Majumdar, MD – GBCI, Sr. Vice President – USGBC to Mr. Sanjay Banga, CEO, TATA Power-DDL and Mr. Praveer Sinha, Chairman, TATA Power-DDL and CEO, Tata Power at Mumbai during the Distribution Utility Meet 2018 (DUM 2018). As, part of the PEER process, Tata Power-DDL identified opportunities for continuous improvement, that includes reducing sustained interruption and improving their energy generation mix. Tata Power-DDL energy mix accounts for dependency on 75% Coal, 13% Gas, 8% Hydro and 2% Nuclear. Tata Power-DDL is a frontrunner in providing reliable, affordable and quality power to its consumers by implementing state of art technologies. Tata Power-DDL has the Advanced Distribution Management System (ADMS) integrating SCADA (Supervisory Control And Data Acquisition), DMS (Distribution Management System) and OMS (Outage Management System) on a single platform which has the capability of performance monitoring, tracking and control of distribution network, fault and outage management and network performance optimization across the 1128 circuits. Moreover, to reduce interruption and build the system for resiliency, 50 percent of the cables are underground and the electrical infrastructure prone to flood are identified and elevated as per the guidelines of CEA (Central Electricity Authority). Tata Power-DDL is known for its customer-centric initiatives and policies. Through the rooftop solar program for consumers, the Company has implemented 124 rooftop solar plants under net metering with a cumulative capacity of 15MWp. In addition, 1.76 MW distributed solar PV system was installed as part of the sustainability initiative. All these measures have helped in a cumulative cost savings of INR 177 million and carbon emission reduction of 448.02 kilotons per annum. Additionally, TATA Power-DDL met all the prerequisites including reliability monitoring, energy efficiency & environmental disclosure, system energy efficiency disclosure, triple bottom line and consumer survey. To have a consumer survey in a prescribed format is a basic requirement in PEER and TPDDL has met this through their recent survey and achieved a customer satisfaction index of 4.5/5.